Most people starting a business do so because they have a good business proposition and the enterprise and commitment to see it through. However, they may not be experts in the legal and financial aspect of running a business and such matters offten appear dauting. Fortunately you do not need to be an expert in these fields to succeed in business but you do need the support from experts. Allum Book-keeping Services can help you with starting your business. I can complete and submite your self-employed registration with HMRC for you and if required prepare and submite you self assessment tax return. and if required, prepare the necessary VAT returns. and if required, prepare the necessary VAT returns. and and if required, prepare the necessary VAT returns. and if required, prepare the necessary VAT returns. and if required, prepare the necessary VAT returns. Employers are facing ever-increasing obligations regarding the maintenance of their payroll records. I offer a full payroll bureau service and can remove the worry and hassle of payroll administration. Alternatively I can help you with setting up and running your own payroll system. I can also provide Sage instant and Sage 50 payroll software. 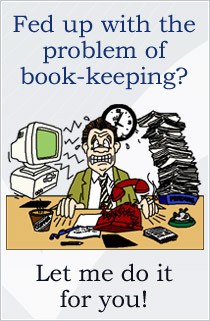 I offer a full bookkeeping services and can remove the hassle of your bookkeeping. Alternatively I can help you with setting up and running your own accounts system. I can also provide Sage instant and Sage 50 accounts software. I will advise you whether or not you should be registered for VAT and can help you to understand the positives and pitfalls enabling you to make the best decision for your business. I can complete and submite your VAT registration form for you and if required, prepare the necessary VAT returns.